Does anyone today remember that one of Contra Costa's most famous characters was part showman, part charlatan and part mountain man? He was known by children of the 1950's and 60's as the hero of a minor TV series. John Adams, better known as 'Grizzly' Adams, actually roamed the Contra Costa wilderness during 1854-55. He is remembered as one of the strangest characters that the Old West ever spawned. Born in 1812 in Massachusetts, Adams was an adventurous lad exploring the swamps and woodlands of his home. But serious injuries suffered at the jaws of a circus tiger forced him into the boring life of a village bootmaker. In 1849 the call of gold proved stronger than family or friends. Adams quickly abandoned his home and headed for California seeking a fortune and the spice of adventure. Once in the far West, Grizzly Adams made and lost at least three personal fortunes. Adams found digging for gold, farming and ranching less appealing than living as a professional hunter. Also known as the 'Wild Yankee', John 'Grizzly' Adams developed a fearsome reputation as a killer of grizzlies. More than once he survived hand to hand combat with the giant beasts. He always carried a huge bowie knife. This was a wise precaution for it saved his life several times. Eventually Grizzly began earning money trapping bears and selling them for use in exhibits and bear & bull fights. Two huge grizzlies, 'Ben Franklin' and 'Lady Washington,' were raised from cubs and were his favorite companions. These magnificent creatures followed him everywhere like giant dogs enhancing his legendary status among even the hardest-to-impress frontiersmen. 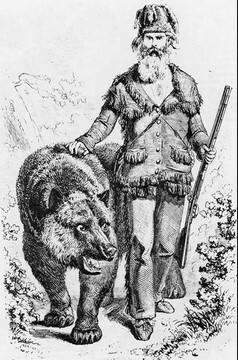 On expeditions to the Humboldt Mountains in Nevada and the Rockies, Grizzly Adams hunted buffalo, bear and collected furs. He also brought back live bears, wolves and pumas to California for sale and exhibitions. By late 1854 Grizzly had abandoned the gold fields of the Sierra Nevada's. Adams found the poorly explored, hot, brushy Coast Ranges of California a paradise for bears, pumas, deer and even an occasional jaguar. He established a permanent hunting camp in the isolated Corral Hollow area of eastern Alameda County at the very edge of the San Joaquin Valley. From his base camp Grizzly Adams would often hunt on Mount Diablo and its Contra Costa foothills, a wilderness rich in elk, deer, bears and mountain lions. Grizzly Adams sold deer and elk meat to hungry travelers. In the spring of 1855, somewhere in the Contra Costa or northern Alameda wilderness, Adams fought a deadly duel with a giant female grizzly who punched a hole the size of a silver dollar in the top of his forehead, a injury which ultimately led to his death. After several other adventures and "close calls" with enraged grizzlies, Grizzly Adams decided that the time had come to seek his fortune in San Francisco by capitalizing on his growing fame as a hunter and frontiersman. By the winter of 1855 Grizzly Adams was showing his wild animal troupe in San Francisco. At the request of the local ranchers, he spent a brief time in the Salinas Valley tracking and killing a famous cattle killing grizzly. The battle was classic Grizzly Adams. He finished off his hairy opponent in a hand to hand fight with bowie knife aided by his pet grizzly, 'Ben Franklin.' Until Adams made friends with Theodore H. Hittell, a local journalist, his future as a showman in San Francisco appeared bleak. In 1860 Adams sailed for New York with his animals looking for new opportunities. During the voyage a seasick bear, 'Old Fremont' reinjured Adams' wounded forehead nearly scalping the frontiersman with a single swipe of his claw. The incident left a portion of his brain exposed which he now kept covered with his wolf's head hunting cap. But as a tough outdoorsman, he shrugged off his injuries and continued to personally prepare his wild animal exhibition. As part of the show, Grizzly Adams was training a lively monkey. The irritated animal bit Adams on his unhealed head wound, the monkey's teeth penetrating his brain. As a result of his new wounds, Grizzly Adams suffered for a several months finally dying on October 25, 1860. He was buried at Charlton, Massachusetts, mourned by his many friends and family. Like so much of the Old West, Grizzly Adams was a mass of contradictions. He loved adventure but after being mauled by a Bengal tiger as a young man, he spent most of his life as a simple cobbler. Adams made his reputation killing grizzlies but deeply loved his many grizzly pets and companions. The 'Wild Yankee' delighted in telling "whoppers" to the incredulous public but some of his wildest tales turned out to be true. In the end his death by a monkey was as strange as his life as both a killer and friend of his ferocious bears. Brewer, William H., 1966, Up and Down California in 1860-1864, University of California Press, Berkeley, CA. Dillon, Richard, 1966, The Legend of Grizzly Adams: California's Greatest Mountain Man, University of Nevada Press, Reno, NV.